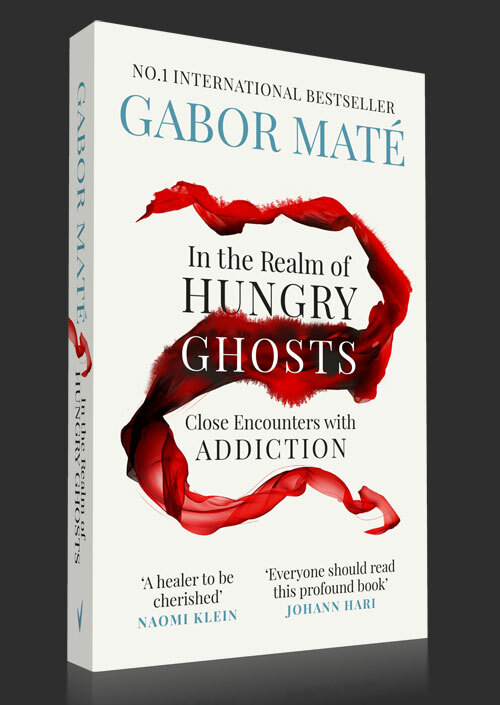 It is with great pleasure that we introduce our Author of the Month for October, Dr. Gabor Maté, with his new book, In the Realm of Hungry Ghosts. Countering prevailing notions of addiction as either a genetic disease or an individual moral failure, Dr. Maté presents an eloquent case that addiction–all addiction–is in fact a case of human development gone askew. 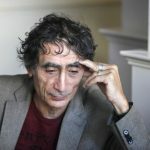 Gabor Mate’s connections – between the intensely personal and the global, the spiritual and the medical, the psychological and the political – are bold, wise and deeply moral. He is a healer to be cherished and this exciting book arrives at just the right time. – Naomi Klein, author, The Shock Doctrine. Last May, Trump congratulated Filipino President Rodrigo Duerte for a ‘great job’ in his crackdown on drugs. Duerte has boasted about personally shooting and killing at least three crime suspects. Human rights groups and the United Nations have condemned Duerte’s vigilante-style campaign that has left thousands of suspected drug dealers and users dead. America’s current top law-enforcement official, Attorney General Jaff Sessions, has also called for stricter enforcement and harsher punishment, believing, in the face of all evidence, that crime inevitably follows drug use. In this book I argue that there is no “war on drugs.” One cannot make war on inanimate objects, only on human beings. And the people the war is mostly waged upon are those who have been the most neglected and oppressed in childhood, for, according to all the science, all the epidemiological data, all the experience, they are the most likely to succumb to substance addiction later in life. In our civilised times we are punishing and tormenting people for having suffered trauma. 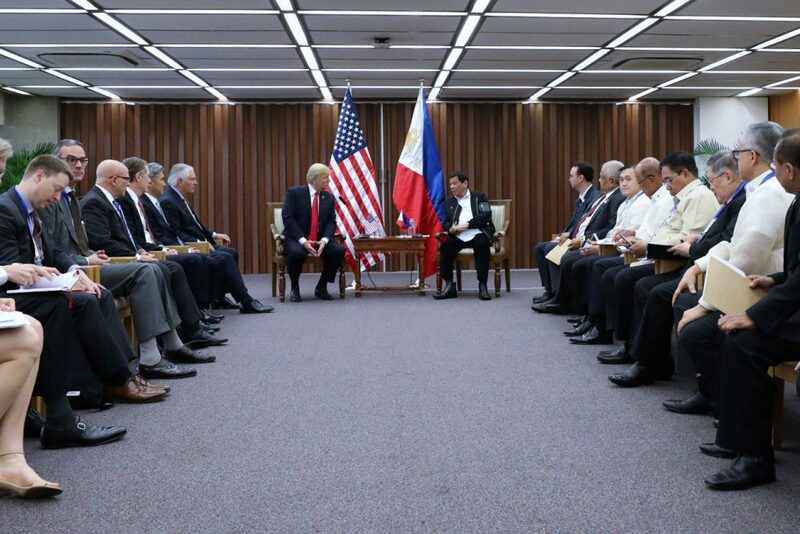 President Rodrigo Roa Duterte and US President Donald Trump discuss matters during a bilateral meeting at the Philippine International Convention Center in Pasay City on November 13, 2017. 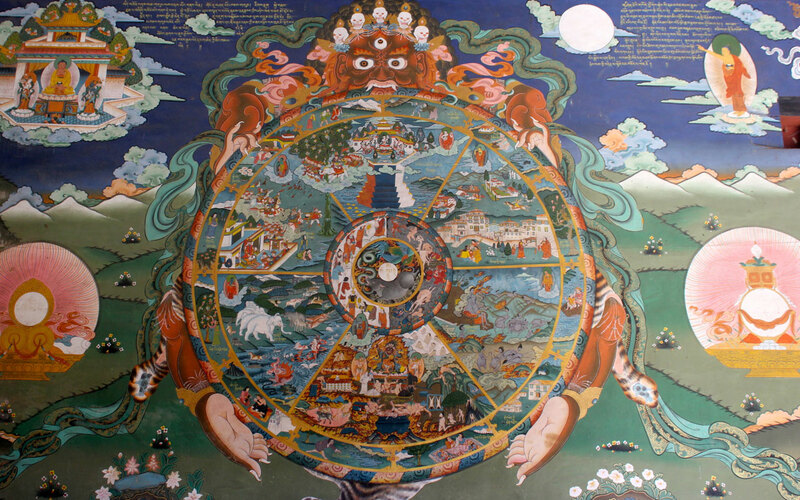 The Mandala, the Buddhist Wheel of Life, revolves through six realms. Each realm is populated by characters representing aspects of human existence—our various ways of being. In the Beast Realm we are driven by basic survival instincts and appetites such as physical hunger and sexuality, what Freud called the Id. The denizens of the Hell Realm are trapped in states of unbearable rage and anxiety. In the God Realm we transcend our troubles and our egos through sensual, aesthetic or religious experience, but only temporarily and in ignorance of spiritual truth. Even this enviable state is tinged with loss and suffering. The inhabitants of the Hungry Ghost Realm are depicted as creatures with scrawny necks, small mouths, emaciated limbs and large, bloated, empty bellies. This is the domain of addiction, where we constantly seek something outside ourselves to curb an insatiable yearning for relief or fulfilment. The aching emptiness is perpetual because the substances, objects or pursuits we hope will soothe it are not what we really need. We don’t know what we need, and so long as we stay in the hungry ghost mode, we’ll never know. We haunt our lives without being fully present. Some people dwell much of their lives in one realm or another. Many of us move back and forth between them, perhaps through all of them in the course of a single day. My medical work with drug addicts in Vancouver’s Downtown Eastside has given me a unique opportunity to know human beings who spend almost all their time as hungry ghosts. It’s their attempt, I believe, to escape the Hell Realm of overwhelming fear, rage and despair. The painful longing in their hearts reflects something of the emptiness that may also be experienced by people with apparently happier lives. Those whom we dismiss as “junkies” are not creatures from a different world, only men and women mired at the extreme end of a continuum on which, here or there, all of us might well locate ourselves. I can personally attest to that. “You slink around your life with a hungry look,” someone close once said to me. Facing the harmful compulsions of my patients, I have had to encounter my own. No society can understand itself without looking at its shadow side. I believe there is one addiction process, whether it is manifested in the lethal substance dependencies of my Downtown Eastside patients; the frantic self-soothing of overeaters or shopaholics; the obsessions of gamblers, sexaholics and compulsive Internet users; or the socially acceptable and even admired behaviours of the workaholic. Drug addicts are often dismissed and discounted as unworthy of empathy and respect. In telling their stories my intent is twofold: to help their voices to be heard and to shed light on the origins and nature of their ill-fated struggle to overcome suffering through substance abuse. They have much in common with the society that ostracises them. If they seem to have chosen a path to nowhere, they still have much to teach the rest of us. In the dark mirror of their lives, we can trace outlines of our own. Bhavachakra from Bangalore, India. The Mandala (Wheel of Life) represents the Realms of Desire in the Buddhist Universe. The Realms of Desire includes the heavens, asuras, humans, beasts, hungry ghosts, and hell. The Wheel of Life is held by Yama, the Lord of Death. Yama is shown biting its teeth into the wheel, symbolising the Realms of Form that may be destroyed at any time. 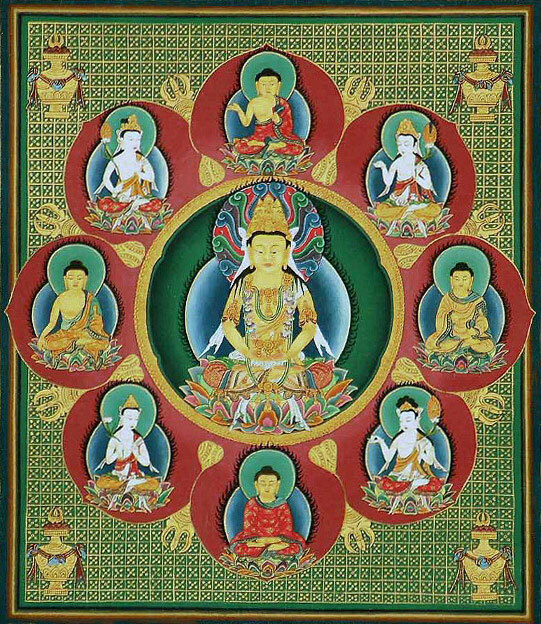 A buddha is located on the upper right corner of the Mandala, with his right index finger pointing upward, indicating that the practices of Buddhism can liberate sentient beings from the endless cycle of life and death. The Buddha taught that everything arises and exists in dependence on other things; enlightenment can only be attained by freeing oneself from all of the 12 karma formations: Craving, Feeling, Contact, Six Senses, Name & Form, Consciousness, Act of Volition, Ignorance, Old Age & Death, Rebirth, Becoming and Clinging. Inevitably, addictions are most prevalent and most deadly among populations who, historically, have suffered the most trauma and dislocation. In early March 2018, I was invited to return to the Blood Tribe Reserve, a Blackfoot community near Lethbridge, Alberta, to speak at a conference on youth. In the words of their physician, Dr. Esther Tailfeathers, the community had experienced “a perfect storm” two weeks earlier, on February 23. Welfare payments meant there was money around. Drug dealers descended on the reserve—drug dealers in this case being largely young people themselves, hopelessly mired in poverty in a place where unemployment is at nearly 80 per cent and where the housing situation is so dire that sometimes three families—up to twenty people—share a house with one bathroom and six or seven people per bedroom. The dealers traffic to support their own drug habits. There was a blizzard in the evening, so the emergency personnel had trouble manoeuvring on the roads. That night brought nineteen overdoses and one stabbing death. Among those who overdosed, only two died; a tragedy the community could rightfully if unhappily consider a triumph. They had instituted harm reduction measures such as making Naloxone, an injection to reverse opiate overdoses, readily available to people. The conference had been called because so many Blackfoot youth have been falling victim to addiction or exhibited other manifestations of trauma. Suicides, self-cutting, violence, anxiety and depression occur at a high rate in Canada’s First Nations communities, as they do on American Indian reservations and in Australian aboriginal communities. The ordinary citizen simply has no idea, cannot even begin to imagine, what misfortunes, tragedies and other kinds of adversary many Native young people experience by the time they reach adolescence—how many deaths of loved ones they witness, what abuse they endure, what despair they feel, what self-loathing plagues them, what barriers to a life of freedom and meaning they face. In countries with a colonial legacy, the questions we must ask are straightforward. How do societies move to heal the multigenerational trauma that drives the misery of many Native communities? What can be done to undo the dynamics our past has dictated? Some may balk at such inquiry, fearing the discomfort that comes with guilt. In truth, this is not a matter of communal guilt, but of communal responsibility. It is not about the past. It is about the present. And it is about all of us: when some among us suffer, ultimately we all do. Such failure of imagination is seen is every realm, from personal relationships to international politics. Simply put, it reflects that clinging to identity which is our way of belonging to a group. And if we identify with a group of any dimension narrower than all humanity, there must then be others who, by definition, do not belong and to whom, we may believe at least unconsciously, we are superior. That superiority makes us feel entitled to judge, and to remain indifferent. Preventing and healing trauma is a universal issue, not restricted to any one class or any particular ethnic or racial grouping. In fact, as I get to know more about Native ways I am often struck by the thought that we hurt ourselves when we dismiss cultures whose core teachings and values, if appreciated by modern society, could help heal our world. First section of the Hungry Ghosts Scroll located at the Kyoto National Museum. The scroll depicts the world of the hungry ghosts, one of the six realms of Buddhism and contains tales of salvation of the hungry ghosts. This particular section explains how those who have been born as hungry ghosts are saved by the offerings of the living. It relates the story of one of the thirty-six types of hungry ghosts who constantly seek water to drink and depicts the suffering of these creatures. What are the causes of addictions? What is the nature of the addiction-prone personality? What happens physiologically in the brains of addicted people? How much choice does the addict really have? Why is the “War on Drugs” a failure and what might be a humane, evidence-based approach to the treatment of severe drug addiction? What are some of the paths for redeeming addicted minds not dependent on powerful substances—that is, how do we approach the healing of the many behaviour addictions fostered by our culture? The narrative passages in this book are based on my experience as a medical doctor in Vancouver’s drug ghetto and on extensive interviews with my patients—more than I could cite. Many of them volunteered in the generous hope that their life histories might be of assistance to others who struggle with addiction problems or that they could help enlighten society regarding the experience of addiction. I also present information, reflections and insights distilled from many other sources, including my own addictive patterns. And finally, I provide a synthesis of what we can learn from the research literature on addiction and the development of the human brain and personality. Although the closing chapters offer thoughts and suggestions concerning the healing of the addicted mind, this book is not a prescription. I can say only what I have learned as a person and describe what I have seen and understood as a physician. Not every story has a happy ending, as the reader will find out, but the discoveries of science, the teachings of the heart and the revelations of the soul all assure us that no human being is ever beyond redemption. The possibility of renewal exists so long as life exists. How to support that possibility in others and in ourselves is the ultimate question. I dedicate this work to all my fellow hungry ghosts, be they inner-city street dwellers with HIV, inmates of prisons or their more fortunate counterparts with homes, families, jobs and successful careers. May we all find peace. I think the idea of “hungry ghosts” is more telling than we realize for much alcoholism and drug addiction could be avoided if we fed our people well. This is why the poor who have no access to good foods succumb. I believe it was the scientist and nutritionists Roger Williams who many years ago understood that without choline and proper fats, the good saturated fats, the body does not make acetylcholine which is a neurotransmitter and an alcohol and which is used to make other neurotransmitters. When the body lacks for choline, and doesn’t get it, it creates a desire which has to be quenched and which alcohol and drugs do temporarily, but they never satisfy the need our body has. What is interesting is that a high carbohydrate diet including lots of sugar in the form of sodas and sweets, depletes the body of choline rather quickly because the body uses the choline to assimilate them. Poor people resort mostly to the cheap foods having high carbs. Then most of these drugs can dissimulate the mind, which is to cut them off from their conscience, and then they become lawless. We need to lay down our swords and the money we spend on them (especially here in the US), and till the earth and raise good food for all of our people. We probably wouldn’t need the swords (scalpels) of the medical profession either. Your comments on the modern world are as pertinent and as illuminating as your insights into the ancient world … I think Robert B ancestors probably built them with the guidance of yours. Could they have used giant ice age mega forna like mammoths and bolide metals to build these amazing sign posts for our species?